We talk a lot about being better together and how our differences make us stronger. But if we’re being real, when it comes to eating, we have NOT been better together. We each independently have bad eating habits. Those bad habits became terrible habits when we got married and began living together. Insert Whole30. The purpose of the Whole30 diet is to eliminate types of food that may be causing other health issues for you. You can read more about it on the Whole30 website. A common benefit? Weight loss. Yeah, we are super pumped that we collectively lost 20 pounds. Another benefit? I learned that eating bread makes me feel bloated. I can indulge every once and while, but only once. No bread binging for me. But the best benefit? We learned how we as a couple can build better eating habits. For us to change habits, we knew it was key for us to do it together. We kept each other committed, accountable, and motivated. Sometimes you just need someone to introduce you to something new to bring out the best in yourself. We’ve always had some sort of sparkling water in the fridge, but Billy never had one until Whole30. His beverage choice was always a Red Bull or a Dr. Pepper. Often his first sip of water was at night when taking a pill before bed. He now swears he could go through life never drinking a soda again. A little motivation can get you over a speed bump. Everyone has a weak point when changing bad habits. Previously, when one of us was eating well the other would convince them to eat something bad (typically pizza). But when on Whole30, we realized those weak moments are key for the other person to step up and be strong. It isn’t always easy because who can really say no to pizza?! Strong teams know how to complete each other. We like staying busy. And often we used this as an excuse for our terrible eating habits. Quick meals are a key to our success in Whole30. If it isn’t quick, we can easily revert back to our old habits. Cooking meals rarely takes us more than 20 minutes… because we do it together. Billy excels at grilling, but hates chopping. I hate touching raw meat, but love rinsing and chopping veggies. We have gotten in a great routine of Billy cooking our protein (usually steaks, chicken, or salmon) and I handle the sides. We continue to follow the rules of Whole30 even after the initial thirty days. It really challenged us to break our bad habits and replace them with some better ones! 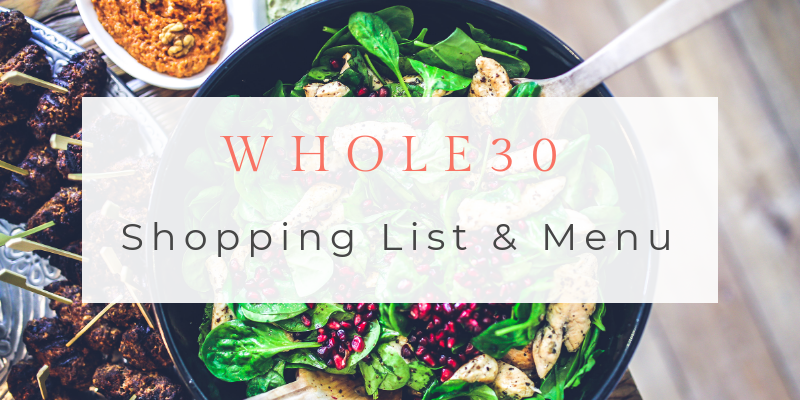 Want to know what two busy professionals eat in a week on Whole30? Get your free download of our shopping list and a week of meals. Unclear Goals: “Without vision the people will perish.” Without clearly defined goals and expectations a team will fail. Rally your team around the goals. We have a podcast on goal setting coming out in few weeks because we believe it is key in a successful relationship or partnership. You must commit to growing together, not apart. Emotional Immaturity: This includes negative attitudes, but also includes defensiveness, constant anger, lack of forgiveness, being overly opinionated, or arrogance. Believing the myth that there is no “I” in team. This is about personal responsibility. It is for this question: What can "I" do to make the team or my relationship better. Following the Golden Rule: Don’t treat others or your partner as you want to be treated, treat others as “they” want and need to be treated. It’s not about you; it’s about the relationship. It's is not I Do, its We Do! Lastly, the number one killer of relationships and collaboration is competition. On a team or in a partnership, a desire for personal rather than team accomplishment undermines the team. Never set up competitive situations-team member vs. team member or partner vs partner. All competition should be the team vs. the opposing team. In sports, an attitude of: the team lost but “I” was the game MVP is a recipe for a losing season. Don’t keep score on personal accomplishments! Let's dig a little deeper into competition since it was the subject of our most recent podcast. The greatest team killer in a long term relationship is the tendency to compete with one's partner and to keep score. It is not so much keeping score that is the problem, it’s that we tend to keep score of all of the negative things and not the positive things. We rarely say: How do I love thee, let me count the ways. Instead we say, I unloaded the dishwasher 5 times this week and you only did it 2 times. The act of keeping score inhibits your ability to empathize with your partner and threatens to foster resentment in your relationship. Because score-keeping is biased, everyone has a different system they use to catalog what is deemed good or bad. Your partner will poke holes in your argument and come back with what he or she thinks is a superior score. Instead of trying to understand your partner’s feelings or point-of-view, you probably reciprocate by finding flaws in your partner’s argument, and so the cycle continues. Try to understand your partner. When sharing your feelings, be clear and own your perspective. It helps to use “I” statements, like I feel judged when you loudly clean the dishes while I watch TV or I feel under-appreciated when I feel like I have to plan all of our dates. Remember that it is OKAY keep score of the positive! We all keep score to some degree, and it is impossible to completely turn off this self-protective instinct. However, you owe it to your partner to track the things he or she gives you, some of which are abstract and may be harder to tally, rather than only keeping score of his or her faults and perceived shortcomings. Challenge yourself to change from automatic me-thinking to conscious we-thinking. Heighten your awareness of the positive things your partner brings to your life, and be more active about showing appreciation for those things to your partner. This helps balance the human instinct to focus on the negative, and it increases the positive interactions between romantic partners. Giving up competing with your partner and scorekeeping is not a call to be silent or readily accept poor treatment. It feels bad to feel like you are giving more than you are receiving in your relationship, and if that is your current position, it is helpful to talk about it. It is something that needs to be addressed. Competition may be a relationship killer, but effective communication can save relationships.